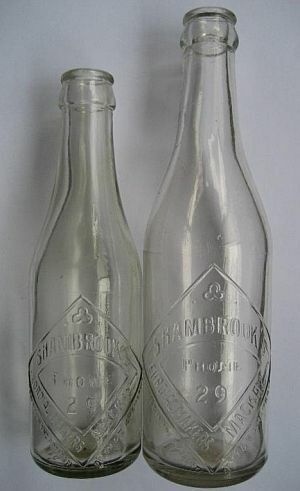 The first Shamies cordial factory was started by Benjamin Shambrook in Cooktown in 1890. About 1905 the firm shifted to Esk and started a factory there. In 1918 the business shifted to Coolangatta where the business continued to be operated by Benjamin and his son George. In 1912 another son, Mr. W.S. (Bill) Shambrook opened a business in Toogoolawah and carried on business there until 1925. Bill Shambrook shifted to Texas and then returned to his father’s firm at Coolangatta. In 1930 Bill Shambrook moved to Mackay to manage the Vestergaard’s softdrink factory. Ben Shambrook was born in Toogoolawah in 1912. He grew up on the Gold Coast attending school in Southport and came to Mackay in 1933. He worked in Vestergaard’s softdrink factory in Victoria Street with his father Bill before joining the Royal Australian Air Force during the Second World War. After the war Ben Shambrook returned to Mackay and bought Vestergaard’s factory in partnership with his father in November 1945 and renamed it “Shamies” cordials. He remained in partnership until his father Bill died in 1951. 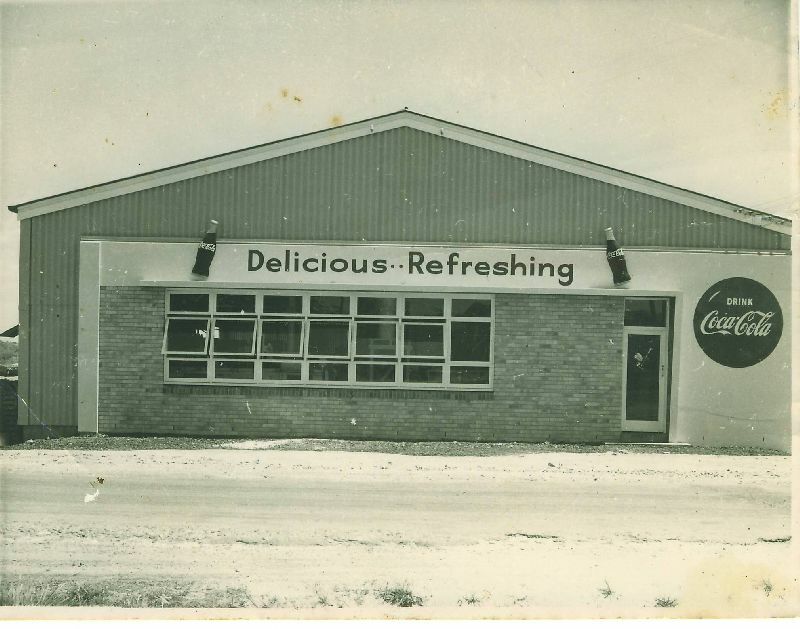 The business moved to new premises in Evans Avenue in North Mackay when he bought the “Coca-Cola” franchise in 1958. At the time "Shamies Cordials" brewed drinks as well. Due to the contractual obligations they were to have strict anti-contamination rules which meant the brewed drinks ceased. 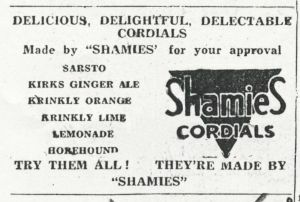 Also around this time the company changed name to "Shammy's Cordials". Mr. Shambrook sold the softdrink business and retired to the Gold Coast living at Currumbin in 1977. He died in Southport in 1985. The Daily Mercury, (1958, August 19), Shammy's Cordials began in Cooktown of the "Nineties". The Daily Mercury, (1985, January 7), Former Mackay businessman dies at Southport. Email received from Bill Shambrook 7 November 2009. Garth and Ray Shambrook along with George, their dad, bottled softdrink, mainly Tristrams at Coolangatta. They also called their business Shamies Cordials. As there business and ours were 2 different organisations, you were not allowed to have two business in Queensland with the same name and spelling, hence the change of business name for us to Shammy's Cordials. To cut the cost of buying bottles we decided to go with the one design, that is why when you view the bottle it has SHAMIES embossed in the glass casting and SHAMMYS on the screen printed label. The big flood on 1958 happened just after we won the rights to bottle Coke so the design of the new factory was raised 1 foot above the level of the river during the flood. As a matter of interest, the 1974 flood came with in 6 inches of entering the factory. A herd of Brahman cattle were washed down the river and a couple managed to scramble up our truck drive way and one came into the front office. The office girl went out the window and the bull, in a blind panic turned the office into match wood. 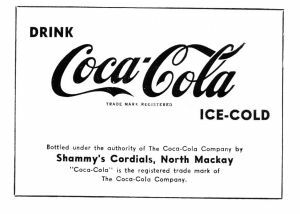 When Coca-Cola was expanding, they offered the franchise to all softdrink factories in Mackay on condition that who ever won the rights had to build a new factory. The other 3 factories at that time were Harrups, Waghorns and McLennan's and they all turned down the opportunity. After we started bottling Coke, the business took off and it was just continued expansion until the business was sold to Rheem Australia (owned by BHP at the time) in 1977. I was not a happy camper when Dad said he was going to sell the business but as he had the controlling interest I just had to grin and bear it. During the negotiations, we sort and received guarantees that the staff would be looked after. Some of them had been with dad since the end of the war. That did not occur and as the guarantee was a handshake over lunch at the Mackay Club, there was not a lot to be done. By the time the factory closed it's doors, dad was living at Tugan and I was serving in the Air Force. 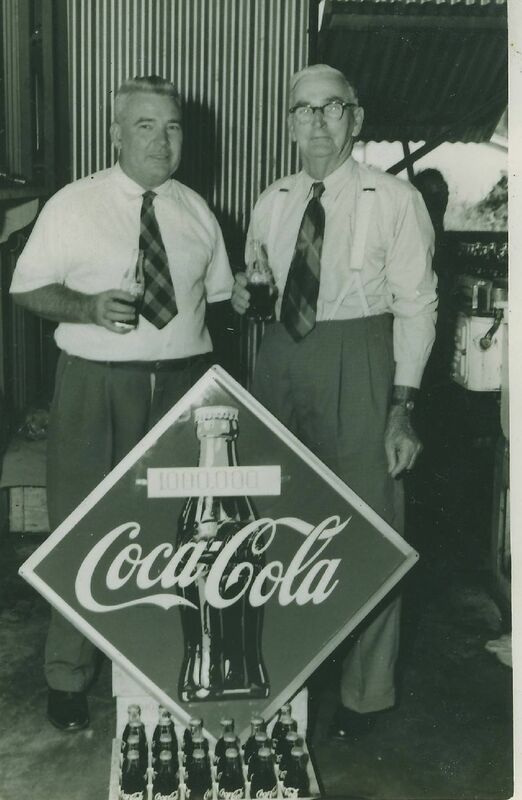 In the photo "opening of the coca-cola factory" Ben Shambrook is standing on the left and the Mayor who I believe was Jack Binnington is on the right with his classy braces. Never saw dad drink Coke so standing there with a half bottle he must have poured the other half down the drain. About the only time he ever wore a tie as well. Some other points of interest not necessarily related to the Coke factory. In 1971 it cost 56 cents for us to buy a 26 oz bottle, in our case it was called the "Family Coke" size. There was a 5 cent deposit on it. That bottle had to do 6 trips, i.e. had to be returned and refilled 6 times before it paid for itself and we or any other manufacturer made a profit. Only 1 in 6 bottles ever made it to a second refill let alone 6. In 1971 we along with the Coke factory at Newcastle and Inverell imported a ship load of bottles from Japan at 1/3 the price that ACI in Brisbane were charging. ACI immediately went to federal government and they imposed an embargo on imported glass. We then discovered that there was a bottle that was made of a plactised glass. It felt and looked like glass but was in fact plastic. I still have one full of Coke on my desk. Well it was very cheap and non returnable. However, the Coca Cola Export Corporation at French's Forest, Sydney, controlled everything to do with Coke production in Australia and New Zealand, stopped us from going ahead with this new bottle. They told us they would never allow Coke to be put in a plastic bottle. This was obviously in the era before PET but I could see it coming. Solo hit the market in about 72 and they were giving Coke grief with the amount of market share they took in Sydney. I went down to Sydney and saw my first PET machine that they were installing at the Solo Factory. I can't remember the name of the owner of that factory but I could see that he was really going to give Coke a lot more grief unless they changed their attitude to plastics. In short, non returnable bottles came about because no one returned the returnable bottles. Of course postmix was a licence to print money. One 4 gallon cylinder of postmix was equivilant to 600 cases of the 6 oz coke bottle. A cylinder took one girl 5 seconds to fill where as to make 600 cases took 18 people 3 hours. We started Rugby Union in Mackay about 1976. A bloke named Nigel Moody was the chief organiser. We was an Air Traffic Controller and got two 7 a side teams organised. We played at the Slade Point School oval. We never got to play the second half in those first few games. Half a dozen cartons of XXXX saw to that. Well it was better than an orange at half time. It wasn't long before we had enough teams to think about going a full 15 a side. It was still a social event and I don't think anyone kept score. I remember a group of Maoris formed a team and it ceased being social then. Nice blokes all of them but they just don't know how to play social rugby. Going through your list of softdrink factories in Mackay, I see none are operating anymore. That is very sad. Just one more thing I thought of. 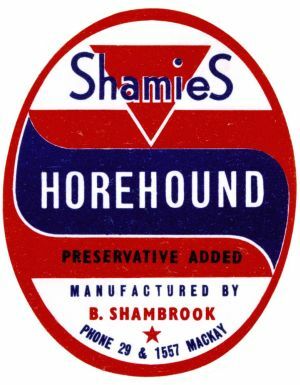 In the mid sixties, our bottles, the 26 oz Shammys bottles were used to bottle beer. Both the Boomerang and Kooyong hotels put draught beer into the bottles and used a plain while label with blue writing on it. They just started doing it when my eldest sister Meryel, got married. At the reception, the staff brought the bottles out to the tables and the guests thought it was a dry weding with only ginger ale on offer. I was still at school then so don't know if it was exactly legal. 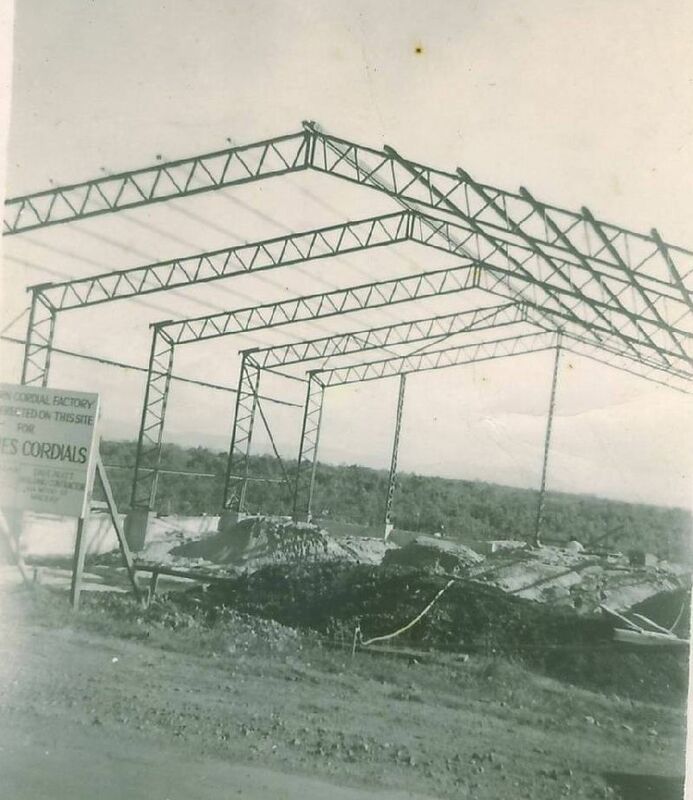 Construction of the Coca Cola Factory in North Mackay 1958. The newly completed Coca Cola Factory in North Mackay 1959. Opening of the Coca-Cola factory. Bill Shambrook on left and Mackay Mayor Jack Binnington on the right. a 300ml example of and enamel label Shammy's bottle c. 1960's A different example with another style of embossing on the neck. 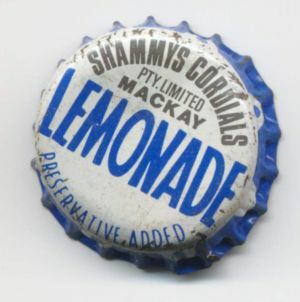 A Shammy's Cordials "Lemonade" crown cap. 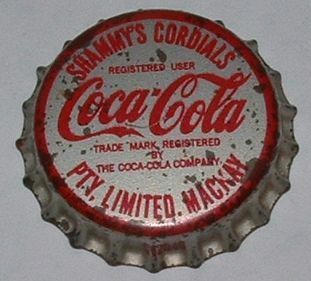 A Shammy's Cordials "Coca-Cola" crown cap. 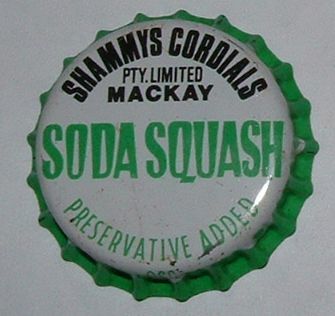 A Shammy's Cordials "Soda Squash" crown cap. 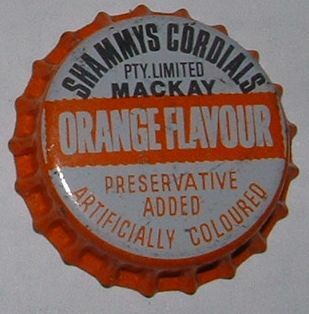 A Shammy's Cordials "Orange Flavour" crown cap. The Daily Mercury, September 11, 1959. p.20 An advertisement from the Mackay Comedy Theatre players programme , April 1961. 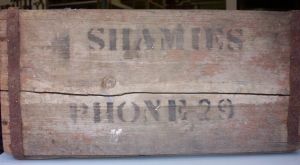 A timber Shamies softdrink crate An example of a Shamies label pre 1958. 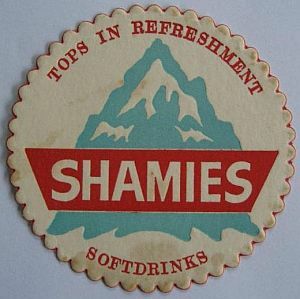 A Shamies Advertising Drink coaster.